Preview Friday 24 September 6 - 9 pm Intervention Gallery is proud to present Diana Taylor's first solo exhibition in the unique context of the Anglican Chapel, Kensal Green Cemetery. 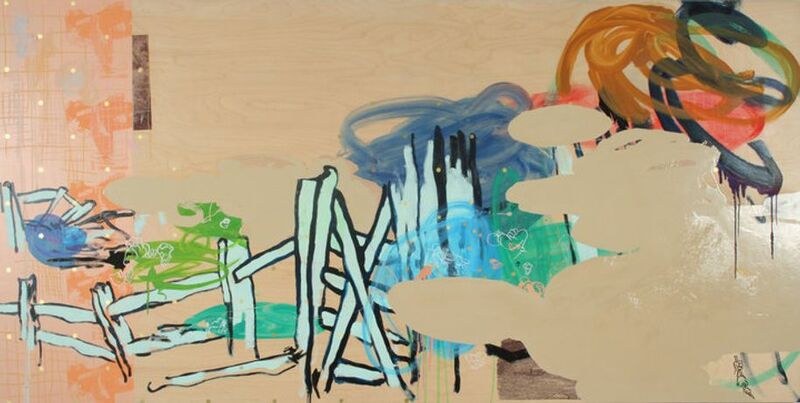 Taylor's paintings all seem to refer to something being or having finished: âSlipping', âDropping', âFallen, Fallen'. The works themselves are littered with things caught in the process of creation, things never quite resolved. Recognisable objects  rocks, clouds, pairs of cartoon gloves  are neither here nor there, translucent sometimes, or half-described. Imagery is layered up, much of it apparently culled from the stuff of domestic cosiness: the frills of doilies, knitted letters, a crooked fence from a children's book. Taylor's works, then, are deeply embedded in a flawed recollection of childhood. They embody the movement of a tongue-tied mind. Taylor's works take time to reveal themselves, so take time. Antic marks  scuds and loops of muted colour  alternately reveal and obscure. Something is always interrupting something else: paint drools down, its descriptive purpose spent. Everything wants to be said, so nothing quite can. What makes Taylor's paintings compelling is in their dramatisation of the push-and-pull of memory and its articulation. Bits of the past come to us at once, jumbled and imperfectly formed, a dream or truth that words can't keep from slipping away. The Exhibition preview will feature a specially commissioned musical interpretation of the works by the V&A's resident DJ Alberto Miguel, as well as the launch of Henji, an independent artists' publication. Please note: admittance to the preview is via the Royal Gate on Harrow Rd, opposite the Total garage.